That said, you should look for the best puppy you can find. A puppy whose parents were genetically tested prior to breeding and that come with a written health guarantee might cost a couple hundred dollars more upfront, but in the long run could save you thousands of dollars in vet bills and ongoing treatment (not to mention heartache). For breeders, testing your breeding dogs for genetic mutations gives you the knowledge to confidently select the proper mate, and the quality assurance to guarantee that the breeding is as free as possible from genetic issues. Again, upfront costs come in to play. Many breeders don’t genetically test their dogs because of the cost – but, like those buying a puppy, that cost is negligible. Paw Print Genetics’ most expensive panel test is for the Labrador retriever, which includes 11 genetic mutations and costs $365. To have both the sire and dam tested, that would be a $730 expense. 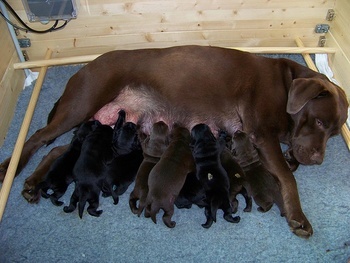 With Labradors averaging 7.6 puppies per litter, that adds $96 to the price of each pup – a small price to pay for a puppy proven and guaranteed not to become ill due to 11 known genetic mutations. That price-per-pup is reduced even further each time you repeat the breeding (the difference becoming profit), while you maintain a clean line of progeny and increase the ethical and financial value of your breeding program overall. Whether you’re buying a puppy or breeding your dog, the upfront cost associated with responsible ownership and breeding is negligible when viewed over the long term.